The Winter has begun, and to take our minds off the snow and the cold, I thought I'd tap into the 2008 Fall/Winter collection (which I haven't explored yet) to feature a fantastic universe that I used to imagine as a child, by the fireplace in the countryside, when my grandfather told me stories to make the time flow quicker, and to put me to bed - fantastic stories which I believed wholeheartedly. 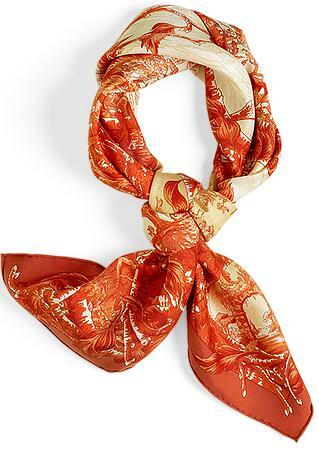 With this scarf, the artist, engraver and landscape architect who worked on Leila Menchari's window displays sweeps us away into a world of 18th century gardens. In these gardens - reminiscent of the "Desert de Retz" in Chambourcy, the "Bagatelle" Gardens in the "Bois de Boulogne", the "Monceau" Gardens in Paris and the "Kew and Stowe" Gardens in Great Britain - plants (whether untended or highly manicured) serve as a showcase for architectural delights including "follies" - or sophisticated - ornamental pavilions, "ancient ruins", columns, temples, arbours, grottos or arches. In the spirit of a mysterious, fairy-tale forest filled with fantasy, "Fantaisie Pittoresque" overflows with lush, green plants. Leaf festoons and intertwining roots outline individual rooms brimming with vegetation; a series of peaceful, timeless places without the slightest trace of human intervention. An immense sense of peace and a very unique silence reign over all. 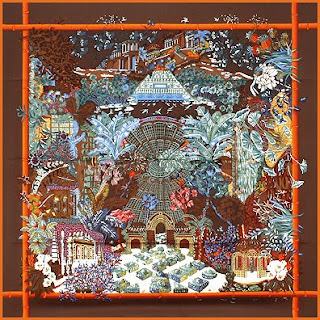 With this scarf, the artist extends an invitation to stroll through his imaginary garden, to fall deep into thought and to dream - in order to reconnect with the elements, with the world of plants and minerals. I find this design very traditional, appealing to someone with a taste for more classic creations, and the sepia colour of this design is lovely. "Les sources de la vie" ("Sources of life") is an appropriate name for the scarf that pays tribute to the impact that water has on the humanity and its prosperity. 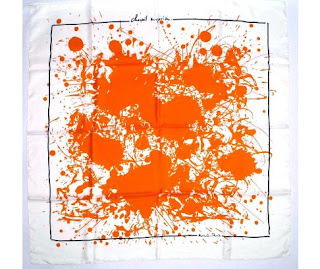 This scarf was designed by Fred Rawyler and issued as part of the Maison's Fall/Winter 2005 collection, dedicated to the "water" theme. 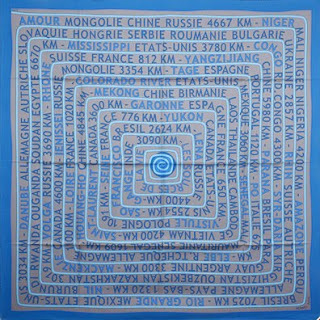 It is a very simple concept - it lists the names of some of the largest rivers in the world followed by the countries these rivers cross and their lengths, in a long series that snails around, starting in the center of the scarf and working its way outwards, like a river that carves its way into the ground until it finds another body of water to join. While I don't find the actual pattern particularly appealing, I do find the theme and the concept quite innovative - hence my desire to mention it in this Costinianus "hall of fame". This Christmas I received the most unexpected gift: a visit from a very dear friend of mine, from France, who was en route to New York via Toronto when many US-bound flights were grounded due to safety and security concerns in the air. So seeing him, after so many years, and indulging him in tourist activities was like a garden that blossoms following a long process of cultivation. "Jardins d'hiver" (winter gardens") captures beautiful this feeling, depicting seven gardens around the world that enchant the visitor with sights, aromas and sounds, reminding us of the majesty and beauty of nature. Created by Annie Faivre as issued in 2007/2008, this scarf illustrates artistic compositions with details from seven distinct gardens: the mythical Hanging Gardens of Babylon, a medieval labyrinth of topiaries, the gardens of the Villa Borghese in Rome, the Majorelle in Marrakesh; the Alhambra in Grenada (Spain), the Taj Mahal gardens and finally the Heian Garden in Kyoto. 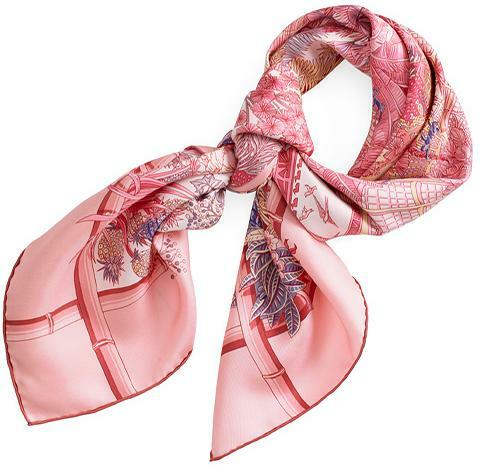 It is a very gracious scarf that wears absolutely beautifully, and when it evoques such strong sentiments, it has an even stronger impact. Today I woke up to a snow-covered city (or at least neighbourhood) and I remembered how pretty - pure, immaculate and simply beautiful - the snow makes everything appear, covering all the dirt and giving one the illusion that everything is indeed pure. Today's post marks the beginning of a series of scarves dedicated to the season and holiday spirit. I took a liking to this scarf a while back, and while I never played with the scarf itself, it never ceases to exude a fairy-tale feeling; in addition, it ties beautifully and would make a fabulous accessory for those who believe in discreet impact. The name - "fleurs d'hiver" ("winter flowers") suggests the delicate flower-like shapes of snow flakes. The pattern is pretty geometric - suggestive of the science behind the perfect appearance of snow flakes, adorned with rain-deer, flowers and naturally snow flakes. This particular colour design is interesting for the brown hues it uses, although the black border is too severe for me and definitely tones down the uplifting induced by the theme or season. There is, however, a palpable harmony in this design that really caught my eye. Perhaps a little tradition due to its geometric sequences, but definitely wonderful. In keeping with the holiday spirit, I thought it wise to start the year with a scarf that echoes the wonderful display of fireworks that celebrate an accomplishment or mark new beginnings. I took note of this scarf when it was first released, several years back, without understanding the significance of its title, or the intrinsic message of the design. 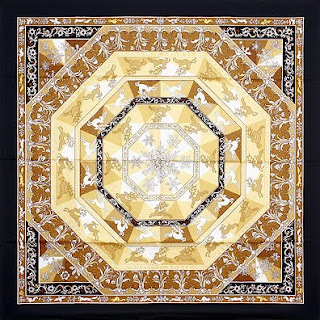 Since I channeled my passion for scarves and my energy to understand and share the beauty of each, I paid closer attention to this scarf and realized how fascinating the design actually is. On closer inspection the ink-blot design, remiscent of Jackson Pollock's creations, reveals horses, horseback riders, carriages and drivers - each one in a dynamic pose (check each corner, plus the areas between them). 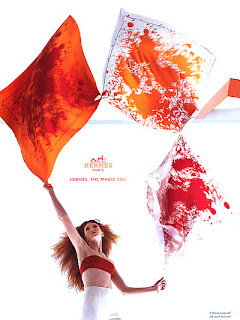 The author is the very talented Dimitri Rybaltchenko, the son of another designer in the service of Hermes, Vladimir Rybaltchenko (who is connected by marriage to yet another one of Hermes famous designers, Phillipe Ledoux). A true visual feast, which I'm only too happy to have added to my modest collection (in the gavroche size), thanks to a kind and sensible person in my favourite country, Japan, who since became a close friend. Thank you MF-san ! So here's to the hope a new year brings and to new beginnings ! !